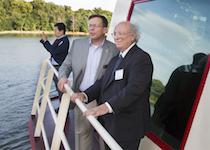 EAST ALTON – The National Great Rivers Research and Education Center (NGRREC) signed a Memorandum of Understanding (MOU) with the Mississippi River Commission (MRC) while aboard the Motor Vessel MISSISSIPPI August 15. The MOU designates NGRREC as a lead research partner responsible for helping shape policies established by the MRC. The MRC is headquartered in Vicksburg, Miss. and provides water resources engineering direction and policy advice to the White House, Congress and the U.S. Army concerning the Mississippi River drainage basin, which covers 41 percent of the U.S. and parts of two Canadian provinces, by overseeing the planning and reporting on the improvements on the Mississippi River. Major General John Peabody, president of the Mississippi River Commission and commander of the Mississippi Valley Division of the U.S. Army Corps of Engineers, and Dale Chapman, president of Lewis and Clark Community College and board chair of NGRREC, both hailed the MOU as a significant moment for all parties involved. Guests of NGRREC and MRC were transported by motor coach from the Jerry F. Costello Confluence Field Station to Lock and Dam 25 in Winfield, Mo., where they boarded the MV MISSISSIPPI, which is the largest towboat on the Mississippi River. The vessel eventually arrived in Grafton where guests disembarked. Throughout the cruise, guests witnessed the MOU signing and heard presentations from NGRREC and MRC scientists about the important, mutual efforts taking place along the Mississippi River watershed. Lead MRC Scientist Barb Kleiss and NGRREC Watershed Scientist John Sloan explained components of ongoing and upcoming projects on which the two organizations will collaborate, including the assessment of existing data and identification of field data collection needs. Sloan gave an overview of the scientific collaborators from the Field Station and the University of Illinois Faculty Fellows program that comprise NGRREC’s pools of expertise. He also spoke about the educational programs at NGRREC, including the Mississippi River XChange, the Mississippi River Symposium and the RiverWatch stream monitoring program. NGRREC Aquatic Scientist John Chick presented information on the Great Rivers Ecological Observatory Network (GREON). The network utilizes a real-time water sampling device called PISCES, which monitors water temperature, oxygen levels, conductivity, turbidity and other water quality indicators while floating in Ellis Island Bay on a GREON buoy. Chick said GREON improves the ability to detect trends, evaluate management actions and expand the understanding of the ecological impact water quality has on the Mississippi River. Data collected can also shed light on pressing issues such as climate change. NGRREC Executive Director Gary Rolfe also highlighted NGRREC’s ability to conduct unique research and data collection. Peabody concluded the presentations by reinforcing the importance of the partnership. “We really need the assistance of scientists and collaboration of institutes like NGRREC,” Peabody said. After disembarking the MV MISSISSIPPI, MRC members and guests toured NGRREC’s home, the Jerry F. Costello Confluence Field Station, which is located at One Confluence Way in East Alton. The Field Station is open to the public Monday through Friday from 8 a.m. to 4:30 p.m. Free, guided tours are given every Friday at 11:30 a.m. The National Great Rivers Research and Education Center is a partnership of Lewis and Clark Community College, the University of Illinois at Urbana-Champaign and the Prairie Research Institute’s Illinois Natural History Survey. For more information about NGRREC visit www.ngrrec.org.